"Allied has been servicing my homes for 7 years and would highly recommend them. Honesty is the most important thing to me and i have never second guessed Jeff or Jennifers integrity. Good folks and Good work." The Allied Aire, Inc. team understands home comfort. When those inevitable cold days hit Cornelius, NC, Huntersville, NC, Davidson, NC, Mooresville, NC, Denver, NC, Charlotte, NC, Concord, NC, Harrisburg, NC, Mt. Holly, NC, Kannapolis, NC and the Charlotte Metro Region, you have to be prepared. Our technicians are knowledgeable in finding the right system for your home, and skilled in the installation, repair, or maintenance of any heating system. With services from our team, you’ll enjoy optimum comfort all winter long. From heat pumps and gas furnaces to hybrid heating systems, we have you covered. We know it’s important to keep your heating system working properly, even throughout the warmer seasons. Don’t get stuck in the cold - contact Allied Aire, Inc. today! Throughout the Charlotte Metro Region, we understand the summers can be unbearable. That’s why we provide expert, timely air conditioning repairs, installations, and service. The Allied Aire, Inc. team is dedicated to ensuring your comfort in your home all year long. We’ll help you keep your cooling system in check with regular maintenance, or professionally install a new A/C unit that fits your home and lifestyle. Our NATE-certified technicians are trustworthy and skilled, so you can feel confident in our services. With trusted Carrier products and a knowledgeable team, you can’t go wrong with Allied Aire, Inc.! The quality of your indoor air can have a huge impact on your health and comfort. Your HVAC system may end up working harder and increasing your energy bills if you're living with poor air quality. With expert indoor air quality solutions from Allied Aire, Inc., you’ll enjoy fresher air, breathe easier, and sleep better. From dehumidifiers and humidifiers to air purification systems and germicidal UV lights, we have the perfect answer to your air quality problems. Our knowledgeable and skilled technicians will work with you to determine the proper solution to improving your indoor air quality. Contact our team today to learn more! At Allied Aire, Inc., we always have the best interests of our customers in mind. We work with Wells Fargo Financial National Bank to offer financing options for your new products or service (with approved credit). 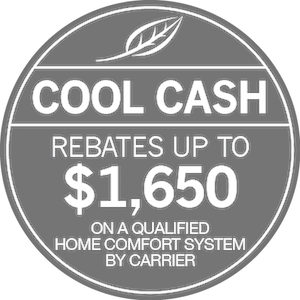 Our goal is for you to enjoy professional, caring service from Allied Aire, Inc. without breaking your budget. You’ll enjoy convenient monthly payments, special financing terms, and easy online account management. Contact our team today or visit our financing page to learn more! Allied Aire, Inc. was established in 2003 as a full service heating, ventilation, and air conditioning company serving the Charlotte Metro Region. Our certified and skilled technicians always provide top quality service with economically sound prices. We’re proud to offer top of the line Carrier products, along with professional installations, maintenance, and repairs. 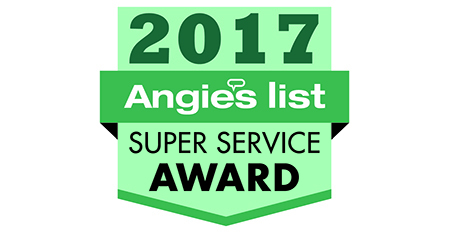 We’re also NATE-certified, member of the ACCA, BBB, and highly rated on Angie’s List. Visit our about page for more information! Allied Aire, Inc. delivers solutions you can rely on. We offer a wide range of quality equipment and procedures to improve comfort, efficiency, health, and safety within your home or business. Gas furnaces, heat pumps, mini-splits, hybrid heating systems, air conditioners, WiFi thermostats, air quality products, ductwork, dryer vent maintenance, and gas piping installation and repair are all expertly handled by our trained and certified team of professionals. In every service we provide, your satisfaction is our number one priority, and we make sure 724-473-3336 is the only number you’ll ever need for your indoor comfort. Contact us for new installation, upgrades, regular maintenance, and repair, and take advantage of our commitment to excellence. We don’t disappoint. Established in 2003, Allied Aire, Inc. is recognized throughout Cornelius, NC, Huntersville, NC, Davidson, NC, Mooresville, NC, Denver, NC, Charlotte, NC, Concord, NC, Harrisburg, NC, Mt. Holly, NC, Kannapolis, NC for superior customer service because we never overlook an opportunity to exceed your expectations. While there are dozens of contractors in the Charlotte Metro Region, none of them do what we do. Our team of licensed professionals go beyond normal procedures to ensure a rewarding start-to-finish process that fulfills your most exacting demands. We hold ourselves to higher standards and proudly stand behind our work with a 100% Satisfaction Guarantee. From courteous, highly trained specialists, to state-of-the-art equipment and industry-leading products, we bring you the very best of everything. It starts with your initial phone call. Speak with an informed member of our staff, and we will immediately place our extensive resources at your disposal. Flexible scheduling, timely arrival, an organized job site, and careful clean-up make it simple and convenient to get the help you need. Our NATE-certified technicians are on call 24 hours a day, 7 days a week, ready to tackle any challenge. No matter how big or small your project, expect personalized attention, accurate information, and cost-effective recommendations. For expert heating & cooling service, repairs, and installations, as well as air quality, ductwork, dryer vent, and gas piping services, contact Allied Aire, Inc. today! At Allied Aire, Inc., we target products and services to better respond to the specific needs of our customers. 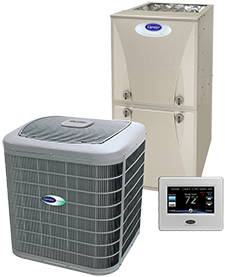 As a Carrier Factory Authorized Dealer, we specialize in the most advanced and recognized heating, cooling, and air quality systems on the market today. There simply is no match for the meticulous engineering, astounding efficiency, and innovative features offered by Carrier. Know that our technicians receive regular factory updates, specific to technological developments, and adhere to rigid service procedures. When possible, we utilize Factory Authorized parts to ensure original sound levels, service life, and efficiency. Our goal is always to optimize cost-savings, performance, and safety. We bring you superior quality in every aspect of service and work diligently to earn your ongoing satisfaction. The mission of Allied Aire, Inc. is to establish and maintain an alliance with the client by providing total home comfort, quality, value, and energy savings with a 100% customer satisfaction guarantee. Creating an environment of teamwork and personal growth with morally ethical values consisting of family, loyalty and respect. Providing honest, caring, reliable service through professional business practices with integrity and transparency. Going above and beyond to exceed expectations and build strong client relationships. Seeking improvement and embracing change through innovation and creativity.